In Autosomal Dominant inheritance, an illness can be caused by a single bad gene coming from mother or father. Some genetic conditions cause illness right away, so it is unlikely that an affected dog would ever be used to breed. Others, however, show no evidence until later on in life, so it is possible to assume that a dog is healthy and breed from it before the genetic illness becomes evident. 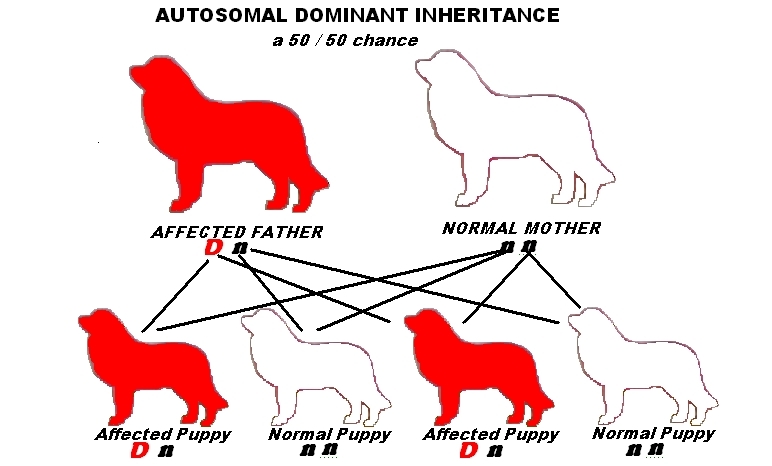 Autosomal dominant illnesses can be easier to identify and eliminate from the breeding population because in their simplest forms, if a dog has the gene it has the illness and you will know it sooner or later. This is different from autosomal recessive illnesses where some dogs can be carriers and never show any outward signs that they have the Illness. There are, however, some forms of autosomal dominant illnesses where the defective gene does not cause immediate symptoms, such as when they are deemed to have "incomplete penetrance". This can make their presence very difficult to detect and eliminate from a breeding programme.